Old Bollywood poster for sale of the action Hindi film, Toofan Aur Bijlee (1975). 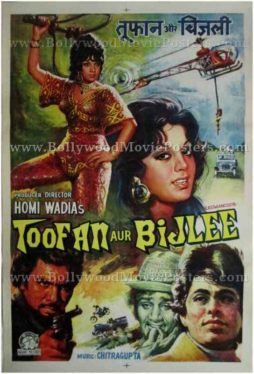 This is an actual surviving old Bollywood poster for sale of the 1975 Hindi film Toofan Aur Bijlee that was produced and directed by Homi Wadia. 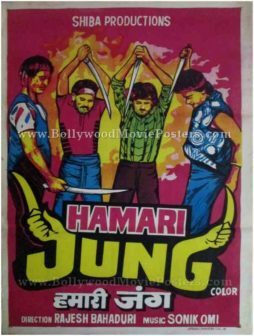 This old Bollywood poster for sale was originally designed and printed for publicity of the first release of the film (somewhere in the mid 1970s) but never ended up being used. Released under Homi Wadia’s Basant Studios banner, Toofan Aur Bijlee starred actress Zaheera in a double role. 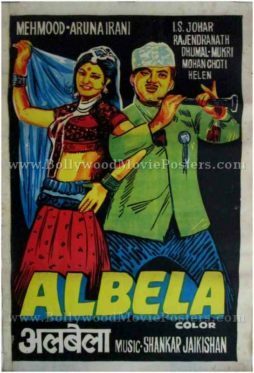 This old Bollywood poster for sale was originally hand painted on canvas by a leading art studio in Bombay. As is typical of Homi Wadia’s action packed films, this old Bollywood poster depicts a daring action sequence featuring a flying helicopter stunt on the top right. 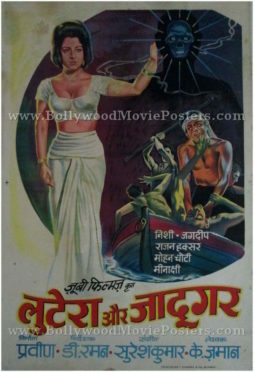 Actress Zaheera is seen in her double role avatar prominently in the center of this old Bollywood poster for sale.